Xenia senior running back Sincere Wells rumbles for a 56-yard touchdown in the second quarter of Friday’s Aug. 24 Backyard Battle high school football game in Beavercreek. Wells finished with 237 yards gained on the ground and four touchdowns in Xenia’s 41-14 win. Quarterback Christian Severt scores Xenia’s second TD of the game from 3 yards out, Aug. 24 in a 41-14 win over Beavercreek on Frank Zink Field. In a losing effort, Beavercreek’s Chris Lawrence had gained 94 yards rushing on nine carries, Aug. 24 in a 41-14 loss to Xenia in the annual Backyard Battle high school football game. 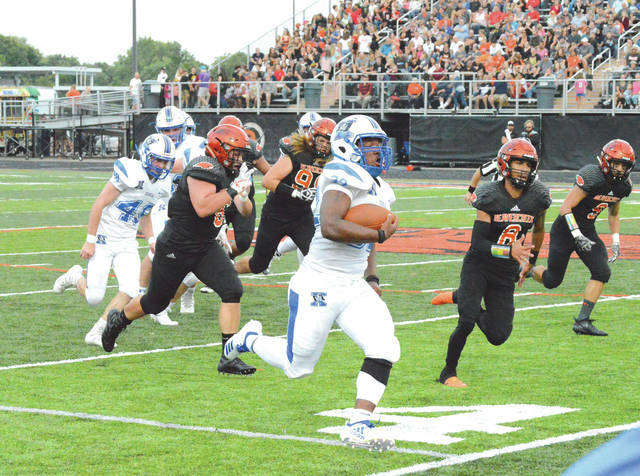 BEAVERCREEK — A solid running game and fewer mistakes earned Xenia a solid 41-14 season opening Backyard Battle win over host Beavercreek, Friday Aug. 24 at Miami Valley Hospital Stadium’s Frank Zink Field. Buccaneers back Sincere Wells rumbled for 237 yards and four touchdowns on 20 carries to lead the way. Beavercreek never seemed to be able to get its offense going. When it would gain some ground, costly penalties would nullify any Beavers progress. Unofficially, Beavercreek was flagged six times for 60 yards. Two of those penalties were of the personal foul variety, and one Beavercreek player — it appeared to be senior linebacker Cameron Etienne — was ejected early on in the second half as a result of the second one. Wells scored his first TD on Xenia’s opening drive. The Bucs rolled 62 yards on 11 plays, punctuated with Wells scoring from three yards out. Wells converted a 2-point conversion run as well, for a quick 8-0 lead. On Beavercreek’s initial drive of the contest, they were flagged for a personal foul, intentional grounding and an intentional delay of game. The drive got as deep into Bucs territory as the 13-yard line, but penalties stalled things on Xenia’s 38. Xenia took its next possession from its own 18 and scored again. Capitalizing on a pair of Beavers encroachment penalties, the Bucs needed nine plays for quarterback Christian Severt to scoot in for a score from 3 yards out. Hayden Falvey nailed the point after and Xenia was out in front 15-0. Severt also scored a touchdown in the second half. After Severts’s first score of the night, Xenia then pulled a play out of the Beavers’ playbook and converted an onside kick. Wells made quick work of this drive, speeding through a hole on the right side of the Beavers defense for a 56-yard touchdown run. Falvey booted another PAT and the rout was on. Unofficially, Xenia gained 338 yards on offense, with Wells accounting for most of it. 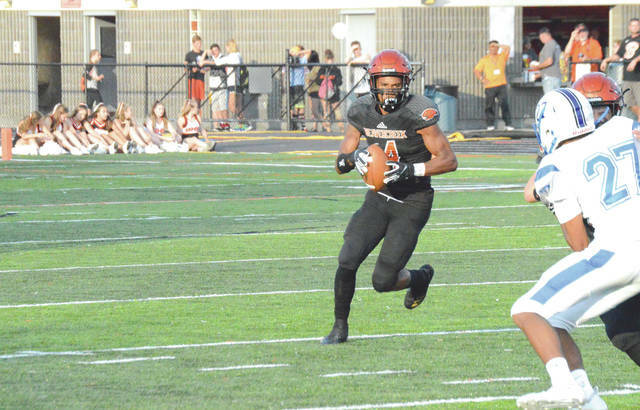 At one point, Beavercreek’s Chris Lawrence had surpassed the 100-yard mark in the second half, but a fumbled snap left him with 94 yards total on nine carries. Forced to play catch-up, Beavers quarterback Brett Cherry threw the ball for 92 yards on 4-for-11 passing, but the senior QB was sacked three times. Cherry scored one of the ‘Creek TDs; Sabastian Rendon scored the other. Austin Bondurant was 2-for-2 in converting extra points for the Beavers. 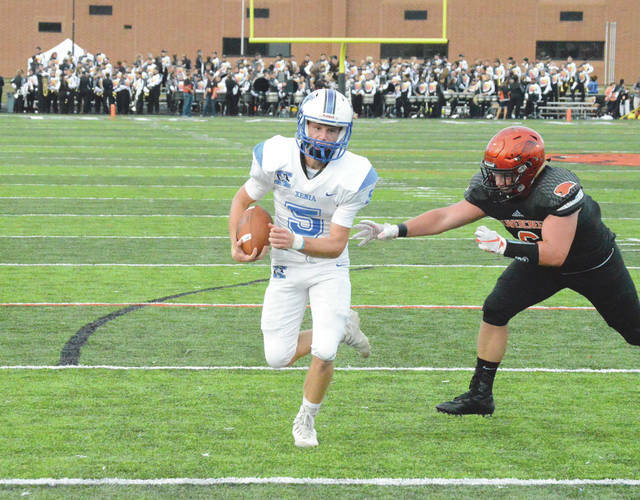 On Beavercreek’s final desperation drive of the contest, Cherry had led the Beavers down to the Xenia 30-yard line but Bucs defensive back Chris Jones ended the threat with an interception and solid runback with 41 seconds left to play. Xenia then ran out the clock for the Backyard Battle win. Both teams are back in action for a pair of 7 p.m. Week Two games on Friday Aug. 31. Xenia will enjoy its home opener at Doug Adams Stadium against Troy, while Beavercreek will stay at home to host Carroll.